Sometimes it pays to mislay your specs. That’s what happened after we bought a tube of this. Staring in the mirror, we’d noticed that after a few weeks’ blast of central heating, hair was looking a bit thirsty (and even a bit frizzy – in Jo’s case, with a section of hair so static that she regularly found it was pointing right at the ceiling). Sure enough, a good, generous squirt rubbed through palms and skimmed through hair every day or so did indeed restore shine, tame the flyaways and seem to put the vibrancy back. (It also created some nice definition – ‘piece-y’ bits in hair that was a little bit too smoothly blown-dry. A few weeks later, however, we got the spectacles out. And discovered it’s actually a leave-in conditioner ‘with an intense formula’ for use on wet hair. Oops! But no matter. 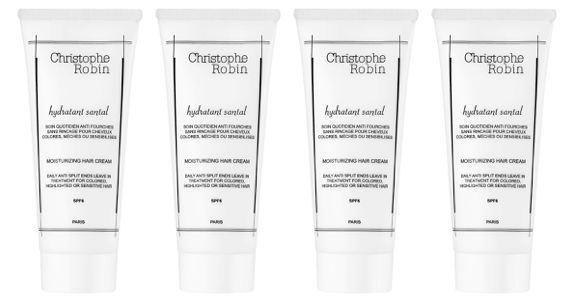 Monsieur Robin (and Beauty Bible readers), you need to know: this is a really great ‘day cream’ for winter-frazzled hair! And that’s exactly what we’ll keep using it for.